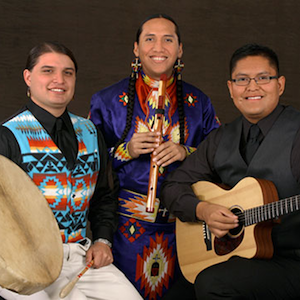 Musicians Tony Duncan, Darrin Yazzie, and Jeremy Meyers are Estan-Bah. Experience the sounds of the Southwest. With the gentleness of the Apache cane, Estun-Bah will take you on an endless journey of love songs and enchanting musical landscapes. The soft blend of the Native American flute with the elegant touch of the acoustic guitar will soothe the mind and enrich the soul. Nominated as Best World Music Album and Best Instrumental Album at the Native American Music Awards, Estun-Bah is the premier Native sound of the Southwest. Soar with the eagles. Listen to the heartbeat of Mother Earth. Feel the first beams of the sunrise.